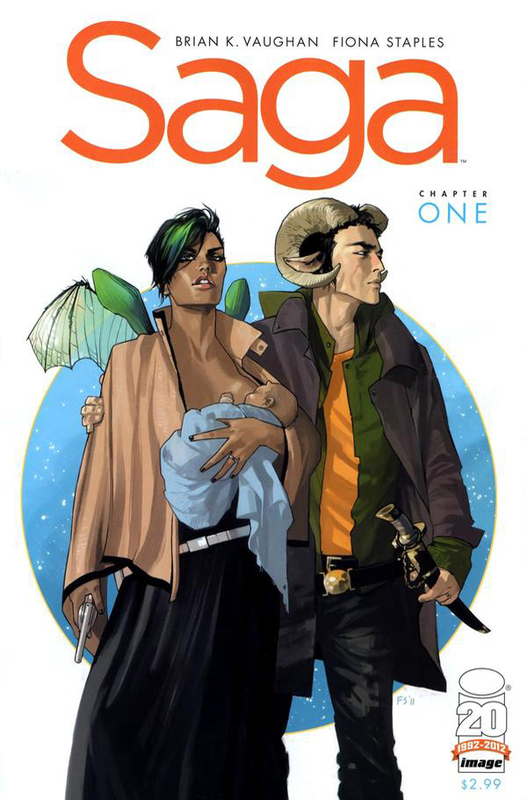 Image Comics’ Saga is the latest series from writer Brian K. Vaughan (Y: The Last Man) and artist Fiona Staples (Mystery Society). The first issue, released on March 14, 2012, introduces the story of forbidden lovers, Marko and Alana, from two warring races. The issue witnesses the birth of their child and the family’s attempts to evade capture in order to live out their lives together peacefully. The first issue of Saga presents two complementary stories, one literal and the other metafictional. The literal story takes place in a universe in which the inhabitants of two celestial bodies, Landfall and its moon Wreath, war against each other on territories throughout the galaxy. Caught in the middle of this war are two forbidden lovers, a Landfallian named Alana and her Wreathean husband Marko, each of whom have deserted their respective armies to follow their hearts. The book begins with an intimate scene in which Alana and Marko give birth to their daughter on a body shop table. Shortly thereafter the family is on the run to evade capture, as both armies have taken it upon themselves to pursue the family to prevent the news of their union from spreading. 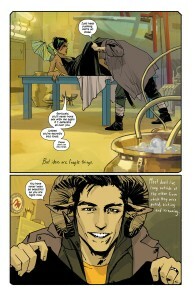 Much like Y: The Last Man, I suspect that Saga will loosely follow a serialized “road trip” format narrative. While the literal story of Saga is one of love and procreation between two distinct cultures sharing close proximity within the same universe, the metafictional story at hand celebrates the union of science fiction and fantasy within the same cohesive narrative of the “science fantasy” genre. Though winged, the people of Landfall more closely resemble characters within the science fiction genre: they portray practical and often well-humored personalities, they ally with humanoid robots, and their primary weapons are firearms. In contrast, the “moonies” of Wreath are visually distinguished by the presence of horns, the use of magic, their weapons include swords and staffs, their language is foreign to Landfallian and reader alike, and their demeanor is both romantic and grave. 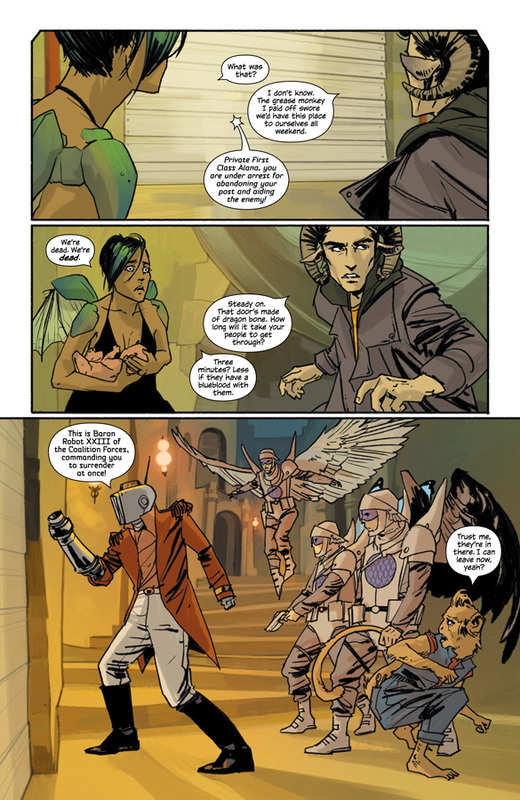 Much like how the daughter of Alana and Marko represents a loving unification of both Wreath and Landfall cultures, Saga is similarly a product that unites two literary traditions. Though each of these premises is hardly novel, their executions display a high level of creativity and talent. Vaughan and Staples create a universe that includes anthropomorphic characters, industrial byproducts from mythical creatures, and sexually active robots (!) existing within a setting defined by galaxy-wide war and delicate political alliances. Within this vast and promising setting, the pair also efficiently portray dialog-based scenes that simultaneously introduce characters, inform the reader of their dispositions, and advance the greater story’s plot. These moments were especially effective during some of the more tender moments in the story, accentuated by Staples’s knack for portraying a wide array of expressions among the characters in the story–humanoid and animal alike. This is not to say the execution was flawless. The first action sequence contained an overabundance of narrative conveniences to the point of appearing as a contrived plot point. Also, why are both the Landfallians and the Wreatheans willing to expend such great resources in order to persecute a single relationship. Both sides admit that knowledge of this relationship could spread and damage troop morale, however they fail to recognize that this liability applies equally to their military opponents. Lastly, the story included some very specific anthropocentric family traditions among the characters in the story, such as wedding bands worn on the left hand’s ring finger and a nine-month gestation period, which were in some respects missed opportunities to further develop the setting. The story could have been even more compelling if marriage symbols were portrayed in a more exotic manner and if the duration of pregnancy lasted either shorter or longer than that of humankind’s. All-in-all, this issue is well worth the admission price. Forty-four pages of interior story that’s ad-free with as high a caliber of work as this book makes the $2.99 cover price a steal. I’m greatly looking forward to the next installment. 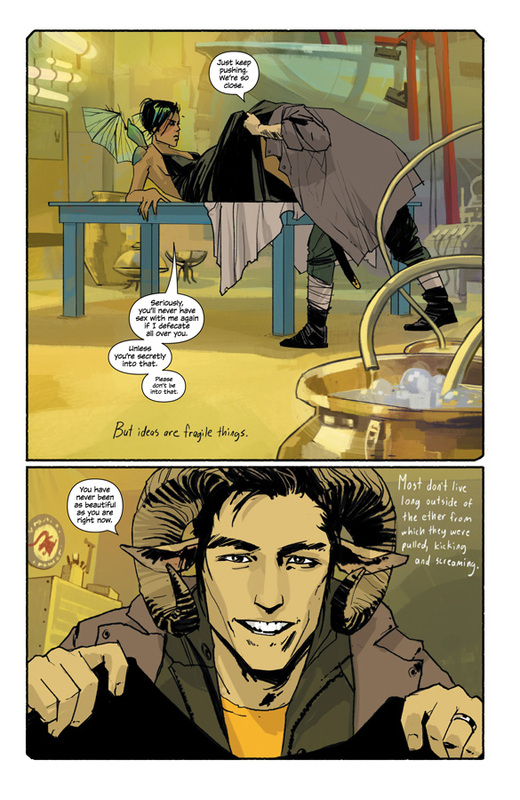 and be sure to check out MLD’s look at Brian K Vaughan’s #1’s (coming soon!). Blind is a junior professor who moonlights as a comic book aficionado. Life has moved him from Orange County, California to Moscow, Russia (привет!). Discovering new patterns among the details in fact and fiction bring him endless joy. These discoveries are typically accompanied with beard instinctual stroking.